The tour guide will tell you that more secular stained glass may be seen in Memorial Hall than in any other building in the world. No image of Christ gazes down from these 22 gorgeous windows. Instead, more or less life-size, here are such worthies as Dante and Chaucer, Charlemagne and Sir Thomas More, Pericles and Leonardo, and Hector parting from Andromache. Inscriptions in Latin evoke virtues desirable in the academy—Disciplina, Patientia, and Fortitudo. All this is meant to refer somehow to the young Harvard scholars-turned-soldiers who perished in the American Civil War fighting for the Union, to whom the building stands as a memorial. The figural windows went up from 1879 through 1904. The one shown here, Peace and Honor, done in 1900, shines with 18 others on freshmen at their meals in the part of the edifice now called Annenberg Hall. A striding young man with spear and shield goes off to war, at left, and returns, a survivor, to give thanks. The allegorical figures Honor and Peace suggest Hera or Athena, familiar characters in a classical undergraduate education, according to art historian Virginia Raguin, writing in the Harvard Library Bulletin. The tableau is the work of Sarah Wyman Whitman (1842-1904), who also created the largest, most complex window on site, in the south wall of the transept. Traditional stained-glass windows use glass of clear, uniform colors—so-called pot metal colors—modeled with vitreous paint, which contains ground glass. Whitman used that and more or less milky glass of variegated colors and a pearly surface sheen, of varying thickness and texture, to achieve opalescent effects. She also layered several glass segments in a technique called plating, which gave her windows a sculptured look. These are painterly windows, and indeed Whitman was a painter in oils. For more about her, see “Vita ,” January-February 2008, page 32. 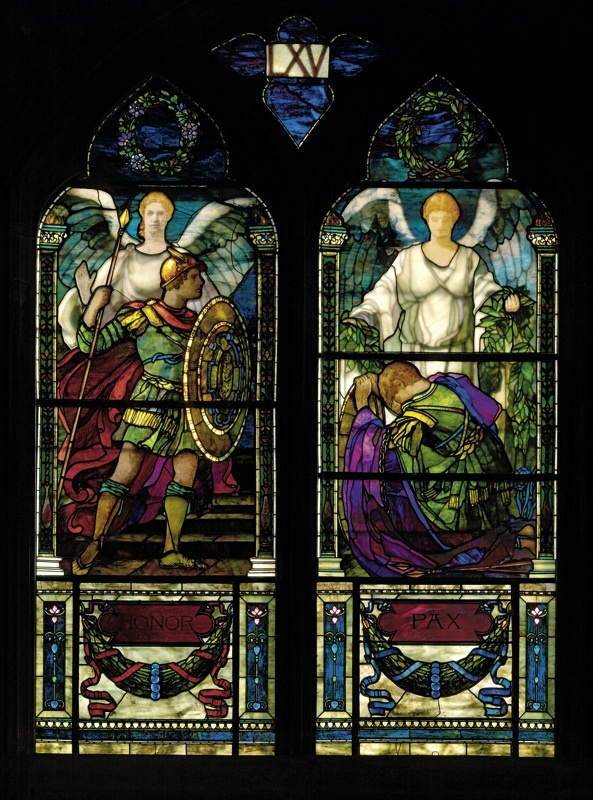 For more about Memorial Hall’s stained glass, go to http://harvardmag.com/war-and-peace . For more about war, read a newspaper. For more about peace, be hopeful.